HAPPY HOLIDAYS! We hope you are filling your days with friends, family, metallic everything, and of course cookies. In last months letter from the editor, Sarai shared that we had a Colette studio party in the works. Today, we are pleased to invite you to the Colette studio for some crafty and festive fun. 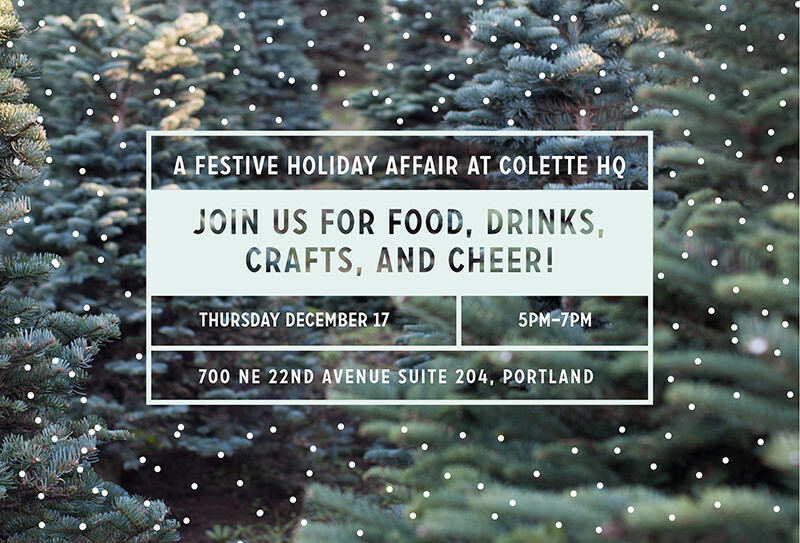 Join us Thursday December 17th at 5pm for food, drinks, music, and crafting. Take a break from your hectic holiday schedule to sip some wine and talk collars, and linings and darts with other sewing enthusiast. Needlework Night at Colette Patterns! Chat with me Sunday on Pattern Review! Blog tour and big giveaway for The Colette Sewing Handbook! Sewing Chatter: Do you sew gifts for the holidays? I sure wish I could come to your party, not much would make me happier. Alas, I live in Minnesota and do not own a jet. Some day I will get to Portland, and hopefully can set up a pop in. Merry Christmas and the best of New Years!